Las Vegas is known for hosting some of the greatest festivals in the world. From EDC to iHeartRadio Music Festival to Life is Beautiful, no city puts on a show quite like Las Vegas. While you may have heard of these more popular festivals, there’s an abundance of lesser known festivals that will delight more than just your ears. Allow your taste buds to salivate at our many culinary festivals, recharge your soul at a yoga or lantern festival, or explore some of our city’s most beautiful art. No matter what (festival) path you choose, Juhl takes an in-depth look and provides tips on how to best experience Las Vegas’ best festivals. For three days every September, thousands of innovative artists unite in Downtown Las Vegas to enjoy a community where music and art transform, positivity prevails, imagination overwhelms and creativity thrives. Life is Beautiful, as its name suggests, celebrates the beauty in the world. From musical performances and comedians to culinary masterminds and muralists, this premiere festival is in a category of its own. Past Headliners: Everyone who’s anyone has played here, including Kanye West, Foo Fighters, Mumford & Sons, Duran Duran, Major Lazer, Stevie Wonder and more. Current Headliners: This year’s event was September 21-23, 2018 and hosted talent from the likes of Arcade Fire, The Weeknd, and Florence & the Machine. Laugh it up with Hannibal Buress, Pete Davidson and more! This is the music event of all Vegas music events! The two day music festival, hosted by Ryan Seacrest at the T-Mobile Arena, has taken place every September since 2011. iHeartRadio Music Festival is where you’ll find over 30 of today’s biggest names, across genres and formats, under the same roof. Past Headliners: From Taylor Swift to Queen to Coldplay to Drake, this Vegas music festival is sure to delight audiences of all ages, backgrounds, and musical preferences. Current Headliners: The 2018 iHeartRadio Music Festival will take place on September 21 and 22. The lineup will feature performances by Justin Timberlake, Mariah Carey, Carrie Underwood, Imagine Dragons, Kygo and Fleetwood Mac. EDC (Electric Daisy Carnival) is a trip on its own. 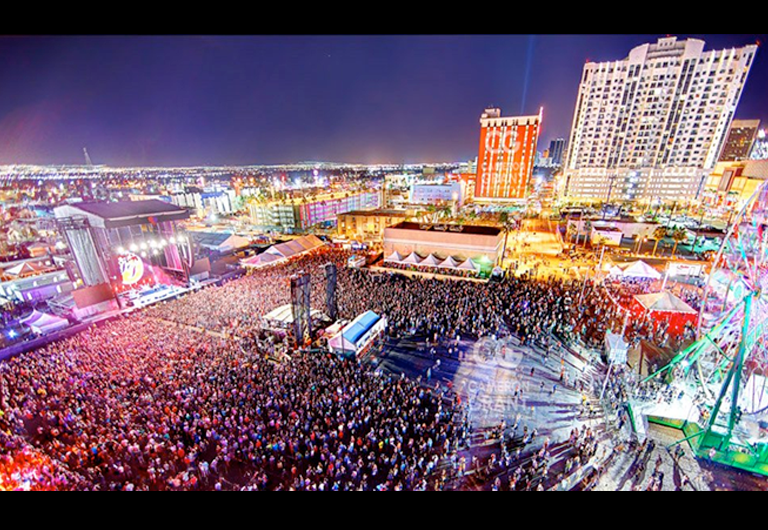 Taking place on the grounds of the Las Vegas Motor Speedway each May or June, EDC transforms into a massive adult playground full of wild attractions and the best EDM artists in the industry. Since its inception, other EDC events have been held at venues across the United States and abroad, including Mexico, the United Kingdom, Brazil, Japan and India. Find your closet’s most electric items, bright colors and tutus preferred, and head to EDC Las Vegas. Past Headliners: The EDM event primarily features electronic dance producers and DJs such as Armin van Buuren, Dimitri Vegas & Like Mike, and Tiësto. Current Headliners: EDC Las Vegas is slated to return to the Las Vegas Motor Speedway for May 17–19, 2019. In need of recharging your soul? 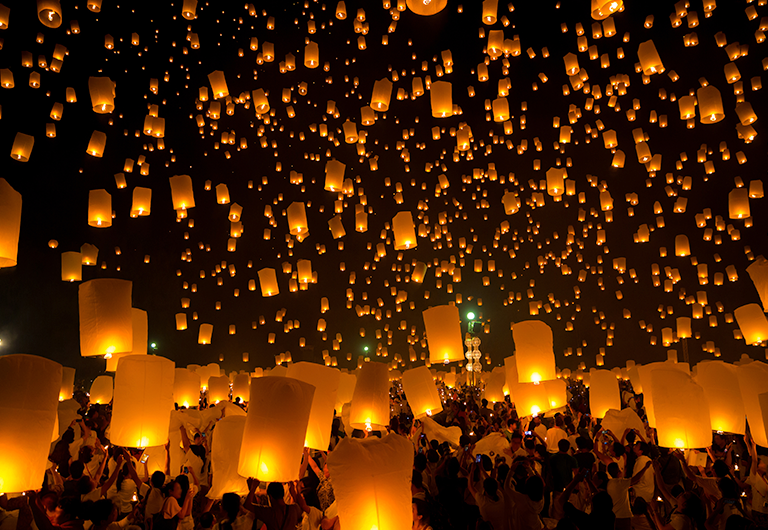 Head out into the desolate desert and check out the RiSE Lantern Festival! Disconnect and get away from it all to experience this uplifting event. Located in the Moapa Desert, RiSE Lantern Festival brings tens of thousands of people together to simultaneously send their light and love via 100% biodegradable lanterns into the sky. RiSE offers on-site parking or shuttles from select parts of Las Vegas, soothing tunes from multiple artists, ADA accommodations, and various food trucks to satisfy your stomach. Get your tickets for October 5th or 6th or wait until 2019 when RiSE takes their festival to the next level. Stay off the grid at the RiSE Luxury Camp, located just a few miles from the RiSE venue. This minimalist resort will exist for 4 nights and will then disappear with no trace. Whatever you decide, bring your hopes, dreams, family and friends to this enchanting Las Vegas festival and come alive. Always remember, together we rise. Presented by Bon Appétit magazine and Visit Las Vegas, Uncork’d has become Las Vegas’ most highly anticipated and widely attended annual festival. Come to the foodie weekend of all foodie weekends and have your culinary fantasies come alive. Vegas Uncork’d allows you to meet the crème de la crème of celebrity chefs one on one while savoring their tasty treats. Every night brings a bacchanal or gala tasting event. Some of these events are more formal, while others err on the causal barbeque side. Stay tuned for 2019’s event information and purchase your ticket soon as the festival’s most famous chefs sell out within days of the schedule’s release. Still not convinced? Take a peak at 2018’s celebrity chef headliners, including Bobby Flay and Giada De Laurentiis. That should sway your appetite. Ready to zen? The purpose of VGY!F (Vegas Gone Yoga! Festival) is connection. Every time you step onto the mat, there’s an opportunity to connect the movement of the body to the internal rhythm of the breath. For many yogis, connection is the ability to fuse one’s self to a higher source of Cosmic Consciousness. Maybe your connection is internal, creating space in the mind and heart to embrace the wisdom found within. Whatever your reason, come to connect with other like minded yogis and teachers for the weekend and experience a range of acro, restorative, and vinyasa flows. The 5th annual Vegas Gone Yoga! Festival will be held on October 5-7th 2018 at the beautiful Springs Preserve, a peaceful 180 acre nature retreat just three miles from Downtown Las Vegas. With over 40 workshops and styles of yoga on the schedule, VGY!F hopes to accommodate the wide range of practitioners and yogis attending the festival. Go to one or go to all! Whatever you do, be sure to treat yourself to one of Vegas’ finest festivals. Your taste buds, ears, and soul will thank you!